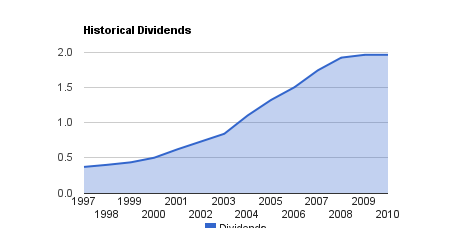 The Bank of Nova Scotia, also known as Scotia Bank, is a dividend darling in Canada. I have been quite impressed in its history for having paid dividends since 1833. That's 178 years of consecutive dividends. Scotia Bank has invested heavily in Central and South America. Out of 70, 772 employes, 30,498 employees are Spanish speaking employees, 32,466 are Canadian employees and the reminder represent other international employees. Its businesses cover 50 countries with 18.6 million customers. Over the past 5 years, Scotia Bank has continued to grow its Canadian and International banking business with Canadian operations up 11% and International growth at 4% for 2010. BNS's 1 year chart shows a steady stock appreciation. Only 2 years ago, BNS had reached a low of 25$ due to all the fear in the markets and it has recovered quite well since. Even making new highs over the past 5 years. Let me first state that BNS has increased its dividends 37 years within the past 40 years. Unfortunately, last year did not see any increase just like most of the other banks. New banking regulation and growth opportunities probably had a part in it. 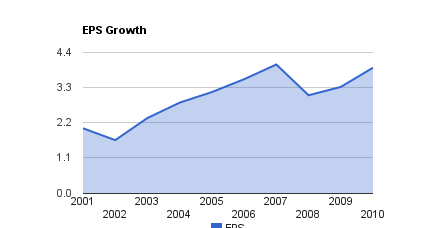 BNS has a decent dividend growth average of 8% for the past 5 years. If I skip last year, their dividend growth averages at 12% with the 10 year average at 15%. Unfortunately, due to the lack of increase in dividends for 2010, Scotia Bank was dropped from the Canadian Dividends Aristocrats. Can you overlook 1 year without an increase, if new policies and regulations from the financial meltdown of 2009 prevented them from making an increase? 178 years of dividends and 37 years of dividend increase in the past 40 years must count for something ... Scotia Bank already meets the Basel III requirements for 2013 and 2018 positioning them for growth. After looking at their payout ratio trend, it's clear that their payout ratio has been increasing and touching 50% in 2009 and 2010. It's 5 year average is at 47.48% which is actually in line with BMO and TD. So far, the trend is for banks to have a payout ratio between 40%-50%. Going further above 50% should be sign for concern, especially as the world economies start recovering. The earnings per share have shown a consistent growth with a pull back during the financial crisis and it's finally picking up again in 2010. 2010 saw a growth of 18% which is almost on par with its 20% average for the 5 years before 2008. We could say it's a return to normal business. Scotia Bank has a very steady return on equity I must say. 2010 saw a ROE of 18.60% compared with a 5 year average of 19.22%. The ROE is quite consistent and ranging between 16% and 22%. It's a good consistency. Prior to the market meltdown, it was ranging between 20% and 22%. BNS is the 3rd largest bank in Canada with a higher than average P/E but not by much. The average is 13.13 splitting the top 3 banks from the others. The above average P/E may reflect the popularity of the bank as an investment since the banks have provided a really good opportunity in the past 2 years. 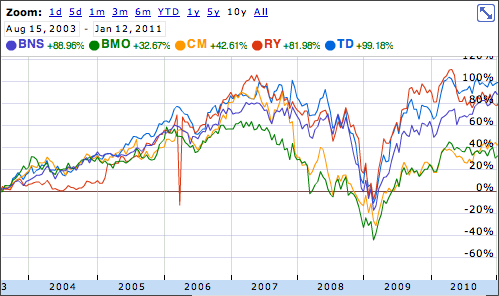 Here is a historical graph on how each of the top banks have performed compared with each other. BNS has been doing quite well. Scotia Bank can be a very complementary investment to other Canadian banks with a different international strategy. I would consider BNS + TD or BNS + RY as a good complement. Fees are also on the raise, starting February 2011, there is an approximate 20% increase in bank account fees (mine that is) and ScotiaITrade, its discount broker, introduced a US$ RRSP account for a 30$ per quarter fee. Who would pay that? There are so many ways to exchange money between Canadian and US currencies nowadays... I guess they have a market if they are doing it. I'll give them the benefit of the doubt. What I see is more fees here and more fees there. As a consumer, it's less money for me so I shop around, but as an investor, I hear the cash register ringing and I say bring on the dividend increase.